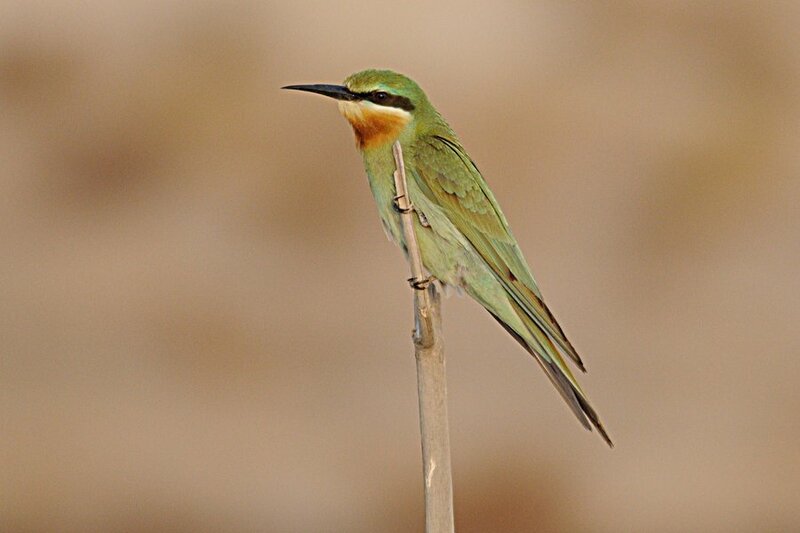 Small flocks of Blue-cheeked Bee-eater are still passing through Dhahran at the moment with the largest group I have seen being nine birds. They are mainly seen in the area between the percolation pond and the main Dhahran Hills housing area where they can easily catch flying insects. They are mainly seen in flight although occasionally one will land on a reed stem or bush for a rest and are normally located by their call well before they are seen overhead. Yesterday the group comprised of only three birds. As the water levels are low and the muddy areas plentiful due to the grubbing out of the reed beds waders were plentiful on the percolation pond. These included one Wood Sandpiper, two Green Sandpiper, two Marsh Sandpiper, four Common Ringed Plover, four Temminck's Stint, six Little Ringed Plover, Seven Common Redshank, 11 Common Snipe, 21 Black-winged Stilt & 38 Little Stint. Herons included 11 Cattle Egret, one juvenile Black-crowned Night Heron, one Little Egret, one Little Bittern and one Squacco Heron. These are the first returning Little Bittern and Squacco Heron I have seen this year. Other good birds included four Garganey, four Mallard, 87 Eurasian Teal and 102 Northern Shoveller. Seven Yellow Wagtail, eight White Wagtail and a single Water Pipit were also present.